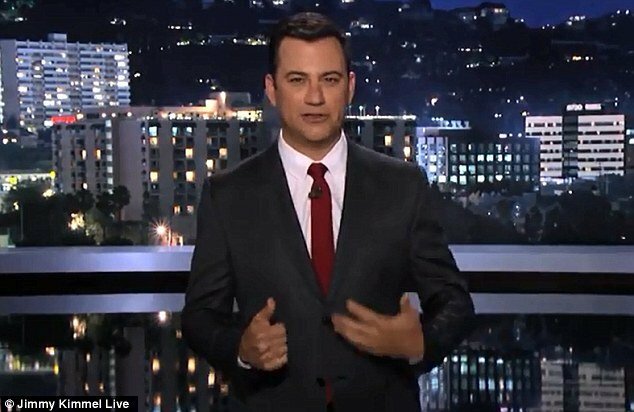 Jimmy Kimmel addressed Kanye West’s profanity-studded Twitter rant in which he went off on the late-night host in response to a bit from Jimmy Kimmel Live that poked fun at Kanye’s much-talked-about interview with BBC Radio One. “Quick question,” Jimmy Kimmel kicked off his monologue on Thursday. Picking up the subject again about 15 minutes later, Jimmy Kimmel described the pre-rant call he got from Kanye West. “He told me I had two choices: apologize publicly…and that was really the only choice!” Jimmy Kimmel said. “Which, by the way, was a spoof,” Jimmy Kimmel reminded everyone. “He said, <<I am the most powerful voice in media. I am ‘Pac!>> He said <<I am ‘Pac>> a few times to me. He said, <<You’ll never be able to show your face at a 14-year-old’s high school football game and be cool again>>. “He really is ‘Pac,” Jimmy Kimmel said, smiling but looking a bit baffled. “I don’t understand it, I don’t know why he’s angry again,” Jimmy Kimmel continued. “Do you have my back?” he asked side-kick Guillermo, who promised, while munching on a snack, to watch his boss’ back. “Right now we’re at Def-Kanye Five,” Jimmy Kimmel concluded. Jimmy Kimmel promised to keep us posted and all remains quiet on the Twitter front for now.